In our previous postings we had seen that morabbas can be made from several fruits but for the name sake, mango is the best. 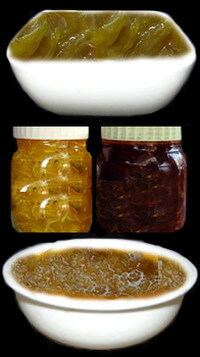 The process in general is preservation of fruits in thick sugar syrup with/without spices. We, especially children like morabba along with chapAtti, pUri, stuffed rOTi and aDai. 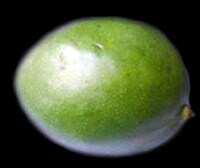 For this you must buy hard, unripe green mangoes with thick pulp portion, thin skinned and sour ones. Clean the green mangoes, wash, wipe and dry under ceiling fan. Cut the stem portion as it oozes out acid. Grate the mangoes and collect the scrapings in a vessel. Boil a cup of water and add the mango scrapings to it. Cook for 5 minutes to soften them. Drain the excess water through a strainer. Do not through the stock. Keep aside separately the cooked grated mangoes and the stock. Now take a thick bottomed vessel and add ½ cup of water and the mango stock along with the sugar. Heat and boil, stirring occasionally, till the sugar dissolves completely. Add the mango scrapings already cooked and mix well. Cook these under low flame till the sugar syrup thickens and turns into 2 string consistency. Add the preservative (sodium benzoate) and mix well. Remove from the fire. Now slightly sauté the cinnamon, clove and cardamom without oil for a minute and powder them. Add this powder to the morabba along with saffron strands and mix well. After the entire morabba is cooled, fill it in jars with airtight lids. 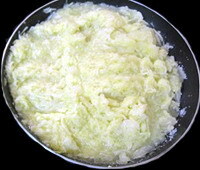 You can add orange or green colour if you prefer when the contents boil but before thickening. This is generally done in the north. Here the mango scrapings are not cooked but to the raw scrapings, a little turmeric powder, 2 tsps of chilli powder, sugar and the powdered spices are added and mixed well. These are put into a big jar and the mouth is covered by a clean muslin cloth and the cloth is tied tightly to the side so that no insects or dust can pass through. The jar is kept in the hot sun for about 10 to 15 days from the sun rise to sunset and the contents are mixed with a dry, clean wooden or stainless steel ladle without touching them by hand. After the entire quantity of sugar is melted and mixed thoroughly with the mango, the jar is no further kept under the sun but sealed with an airtight lid after contents are cooled. If you want to add saffron strands, you can add and mix before the morabba is sealed. You can also store it in small bottles for convenience but remember not to handle it with bare hands but with a dry and clean ladle. This entry was posted on April 6, 2012 at 10:06 pm and is filed under Jams, Morabbas, Squashes and Sauces with tags citric acid crystals, essence, food colours, Jam, Jelly, mango morabba, Morabba, pectin, potassium meta-bi-sulphite, sauce, sodium benzoate, squash, sugar. You can follow any responses to this entry through the RSS 2.0 feed. Both comments and pings are currently closed.